The Basilica of the Holy Cross in Jerusalem is a church in Rome that is located on the east side of the ancient city. According to tradition it was founded by St. Helen, Constantine's mother, in the early 4th century A.D. to house relics that she brought back from Jerusalem—including pieces of the cross on which Jesus was crucified. It is called ". . . in Jerusalem" because, according to tradition, dirt from Jerusalem was spread over where the floor would be laid, and thus it, by extension, was "in Jerusalem!" 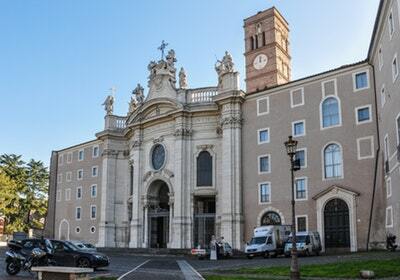 The church is also known as the Basilica Sessoriana, and Santa Croce in Gerusalemme. It was rebuilt in 1144. The present building was constructed in 1743–1744 as noted in the Latin inscription above the main entrance: "Benedict XIV Pontifex maximus in honor of the Holy Cross in the fourth year of his pontificate."